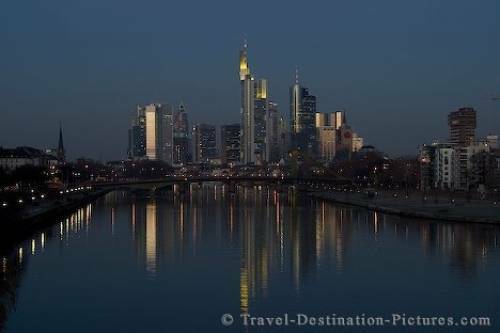 The skyline of Frankfurt is the most spectacular of Germany. Headquarter of most german banks, these companys are have built their skyscrapers in a very little area. This particular view can be seen from a bridge over the river Main - the "DeutschherrenBruecke". Visiting this bridge you can walk at the south bank of the river Main in direction of the city - and you'll have several possibilities taking amazing pictures of the city. Picture of the Frankfurt, Germany skyline lit up at night.